This photograph shows the installed handbrake shoe for the left rear wheel. The shoe is a continuous casting with woven brake material riveted to the exterior of the shoe. The shoe is designed such that an oval bolt (left center in the photograph) both holds the shoe in place as well as serves as the brake actuation. A second bolt opposite the actuating bolt also holds the shoe in place. As the handbrake lever is pulled a series of rods and shafts transmit the motion of the handbrake lever to the actuating bolt such that the oval actuating bolt rotates (for both rear brakes). The rotation of the oval bolt spreads the brake shoe and causes it to contact the inside of the brake drum thus serving as the handbrake for the vehicle. 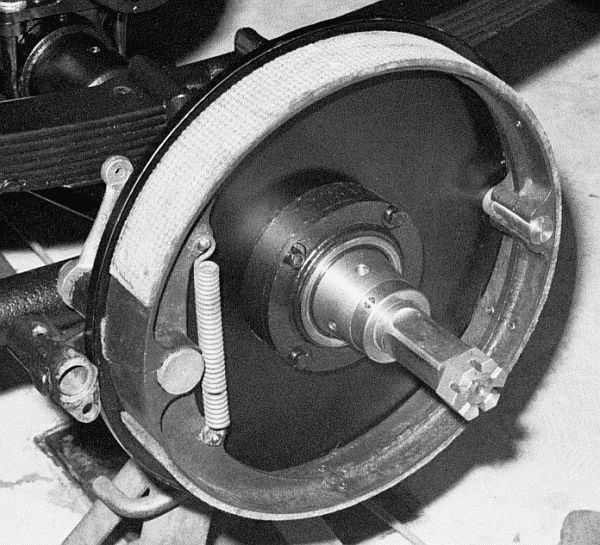 The wheel hub with the brake drum mounted on it is then slid on the axle shaft so that the brake shoe is inside the brake drum with the brake drum stopping an eighth of an inch or so from the metal disk.